Love Food has recently been on a jaunt across the channel so to mark the occasion and to carry on our ice cream theme we have had the inventing hat on to devise this rather delicious little treat. Andrew: I’ve been purchasing good local ingredients for this offering. Dawn: All fresh and juicy in the summer months, when the fruit is at its finest. 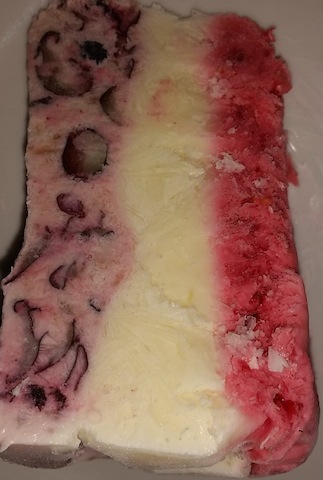 Andrew: I was inspired by the flag of our host nation, and also had memories of Neapolitan ice cream. Dawn: I remember that! Chocolate, strawberry and vanilla; where did that come from? Andrew: Well it seems it was an American invention, Dawn. Early immigrants from Naples brought their gelato-making skills with them, and early versions were in the colours of the Italian tricolore. Pistachio for green, vanilla for the white layer and cherry ice cream for the red. It seems the Americans favoured strawberry, chocolate and vanilla. Dawn: Food history really is a blog in itself. Andrew: Indeed – but we must crack on! Dawn: How do I stop the three layers from merging? Dawn: I have lots of that! Andrew: You will need it but it is worth it. This is a three part recipe, as the layers would imply. In a bowl, mash the raspberries with a fork. You need to mash until the raspberries are of a pulp-like consistency. You can drain the juice through a sieve, if you wish but we included all the flesh and pips in this ice cream concoction. Add one third of the cream, sugar, salt and the juice of half a lemon. Mix well so the red colour is evenly spread. Pour into your container and place in the freezer. Wait an hour or until the mixture is reasonably firmly set. Andrew: All easy so far? Dawn: Now the next stage is our How To Make Lemon Ice Cream. Andrew: So we have simplified the instructions here. Grate the peel of one of the lemons using the fine side of a grater. Squeeze the juice from this grated lemon. Combine the lemon juice with one third of the sugar, salt and cream. Pour on top of the raspberry layer and return to freezer. Wait one further hour or so. Andrew: Finally for the blue layer. I used local blueberries because I love them so much. The end result was more purple, so I would suggest blackberries for a deeper colour, but you may wish to adjust the lemon juice and sugar to your taste. In a clean bowl, mash the blueberries with a fork. They will split and release their juices. Add the remaining third of the cream, sugar, salt and the juice of half a lemon. Mix well so the blue colour and the blueberry pulp is evenly spread. Pour onto your lemon layer container and return to the freezer. Andrew: …et voila! La glace tricolore de France! For more food tips and recipes keep following forfoodlovers.wordpress.com and the Twitter feed @Love_Food_UK. Oh, and Facebook, too – please come and “Like” us! A simple pudding that can be served with custard, fresh cream or creme fraiche to make a filling and tasty conclusion to any meal. On 1 side of each slice of bread, spread the low fat spread evenly across, from corner to corner using as little as possible. Now spread the same side with a thin coating of marmalade. Cut the slices diagonally to create 4 triangles from each slice. Take a medium size ovenproof dish and grease the inside. Layer the triangles of bread, in effect ‘stacking’ them upon each other to fill the dish. Now pour the milk into a bowl, adding the eggs, vanilla essence and sugar. Whisk with a hand whisk until all the ingredients have combined and the mixture has become light and fluffy both in texture and look. Pour the egg mixture over the bread triangles, covering them all. Set aside in the fridge for about 1 hour. 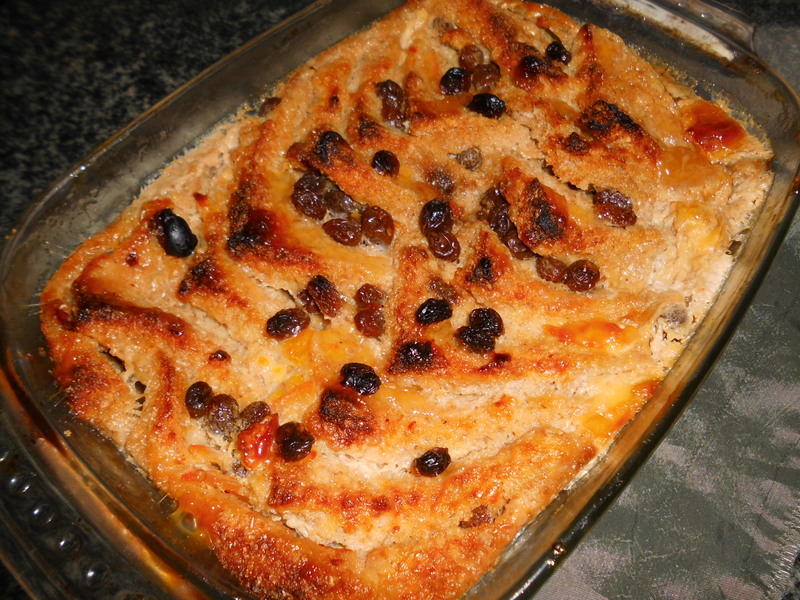 Dawn: This ‘resting’ in the fridge allows the bread to absorb the egg mixture so when the pudding is cooked, it’s thick and morish in texture rather than simply bread slices and egg custard sitting side-by-side. Andrew: Mmm…egg custard! Another simple and tasty favourite! Dawn: Another for the blog! It’s worth pointing out that I used light muscovado sugar which has added a light golden brown tint to the pudding before it was cooked. About 10 minutes before you are due to take the dish from the fridge, turn on the oven to gas mark 4, 180°C electric. After the dish has stood in the fridge for about 1 hour, remove it and allow the dish to reach room temperature before putting it in the pre-heated oven. Andrew: Why do we do this, Dawn? Dawn: Because the dish will be cold straight from the fridge and with the oven already hot, we avoid the dish shattering in the oven by allowing it first to reach room temperature. It’s only a precaution and all you need do is let the dish ‘rest’ for about 10 minutes before putting it into the oven. Place the dish in the centre of the oven and cook for 30-40 minutes until the bread has risen and is golden brown in colour. Remove and allow to cool. Serve warm with custard, fresh cream or creme fraiche. Andrew: We served it with reduced fat creme fraiche so offering a lower fat topping. Dawn: Yes, and we used skimmed milk to reduce the calorific content even further, too. For more pudding recipes, meal ideas and tasty treats that all the family can join in making, follow this blog – www.forfoodlovers.wordpress.com – and Twitter @Love_Food_UK.